With the release of his latest piece, Peter Speake-Marin chooses to heighten the utilitarian character of his Spirit collection with a stealthy covering of matt black DLC. 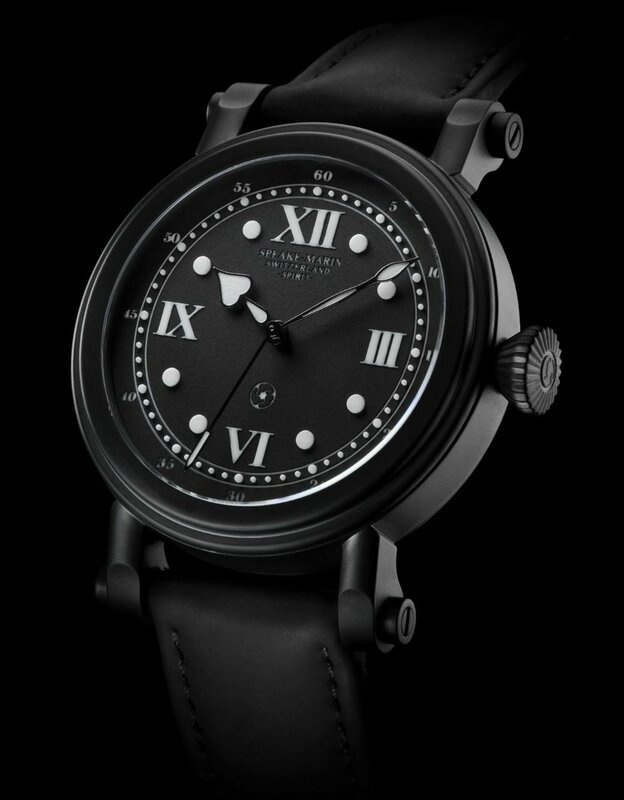 This is the Speake-Marin Spirit II DLC. For an industry once used to Peter's rather well-behaved, exquisitely crafted creations, the Spirit collection must initially have appeared to be at odds with the rest of his portfolio. 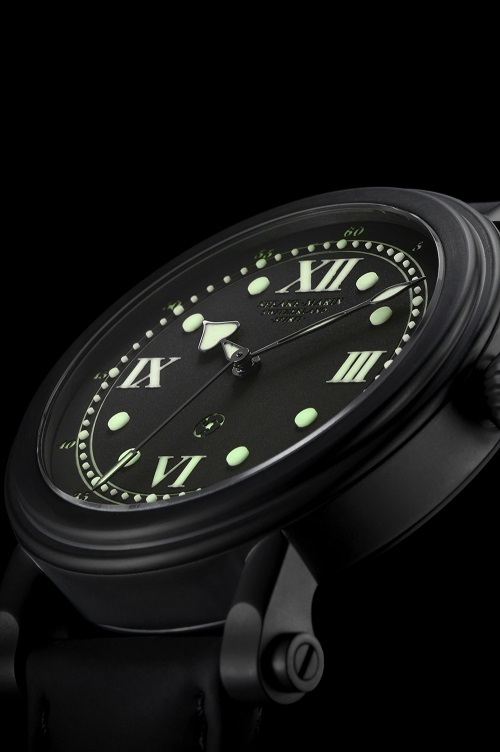 Its matt black lacquered dial shunned the innocence of the crisp white enamel of previous models and its dial was more representative of militaria than of the "Englishness" we had grown accustomed to - and its thrifty price presented its own conundrum. For its maker, the Spirit collection was an important one. The first piece was proof that he could make an elementary timepiece on a budget and was a strong statement of his resourcefulness. Inspired by a military piece which had come under his loupe when he was just starting out and was still uncertain about his future, the adage which he had inscribed on the caseback of the Spirit and the Spirit II, "Fight, Love and Persevere" was one which he and other independent watchmakers understand more than most, having left behind the security of a regular salary in order to realise their dreams, and it was also a timely response to current global economic difficulties. The Speake-Marin Spirit II perfected the proportions of the original with an upsized case allowing for larger numerals and a wider dial on which to showcase the synonymous features of this watchmaker - the shapely playful hands and the "topping-tool" motif. This edition is particularly striking, the darkened case changes everything, the protruding lugs and out-size crown no longer dominate - an illusion for they are as proud as ever - it is to the indications that the eye is immediately drawn and rightly so for the creation of this highly readable 3-D dial is as complex to make as any sliver of enamel. I have said in a previous article that with a watchmaker such as Peter Speake-Marin it is a pleasure to follow the evolution of his portfolio, and that there is a certain level of satisfaction to be gained through documenting the development of a man, and not just a “brand” - especially in this industry. Is the Speake-Marin Spirit II DLC a wayward addition, a self-indulgence by its maker? It matters not, this wickedly beautiful watch is his creation, and this is his story. Welcome to the darkside. Not familiar with Peter Speake-Marin? Allow me to educate you watch by watch.